Who are my teacher leaders and how have I empowered and supported them to excercise greater control over our school? How is the time I structure for my staff moving us forward in our our learning as an organization? Where is our school going next and how am I helping it get there? How are my teachers doing individually, what will it take to truly know, and how do I respond once I figure it out? How are my students doing, how do I know, and what am I doing about it? Everything else should be noise. I stumbled upon an archive of documents I created in 2007, my third year of teaching. Nested six folders deep inside a directory labeled “School,” I found a document called AP Lesson Plan - Introduction - Day 1. In 2007, I taught two sections of AP Psychology to 11th and 12th graders. This was the document I used to draft my ideas for starting that class. Looking at it, two things stand out to me. First, I was much more intentional than I remember. In this lesson plan, I listed goals, materials, action steps, and student deliverables. The plan reads like something I intended to hand to someone else down the road, yet that was never my goal. I remember spending a lot of time writing plans like this thinking it would save so much time later in my career. It did. Second, I didn’t review my syllabus on the first day of class. Instead, I performed a magic trick to get them thinking about the need for control in psychological experimentation. Along with the trick, I shared a long, obviously ficticious, story about hitting my head over the summer and awakening a clairvoyant; I could see the future. The trick backed up my far-fetched claim with some fairly convincing (or at least entertaining) data. Their task was to identify aspects of my demonstration (variables) that would disprove my claim. I would collect their ideas on the board. When all ideas appeared to be exhausted, I would have them prioritize the ideas down to the one (independent) variable they think would be most likely to disprove my clairvoyance. I remember being hung up on the difference between psychology, the science, and the kind of psychology my students see and hear about on television. I wanted to make an early impression that, by controlling variables, we can make educated predictions that test psychological phenomenon, and that this was the type of psychology we would be studying in my class: the kind that is testable and scientific. I never assessed their understanding of experimental design; it wasn’t yet my goal. I simply wanted to demonstrate that clear, nerdy thinking about something as silly as a magic trick, could lead to deeper understanding. And, I wanted to have fun. This was, after all, my students’ first introduction to me, their teacher, and psychology, the subject they would be studying with me over the next year. I didn’t want this day to be about rules, processes, or my pet peeves. I wanted it to be about fun and science! Read and understand the entire syllabus. Give their parents my introduction letter. Return their signed parent statement by the end of the week. The very next class started with a quiz over the syllabus. In hindsight, it was pretty nitpicky, but remember this was an AP class and I was trying to instill a high expectation. For most students, it worked. They came in with a firm understanding of my syllabus. For all, it sent the message that I would hold them accountable to the work I asked them to complete. After quizzing them on the syllabus and answering questions on the second day of class, we’d get to know each other, employing a series of cognitive strategies until everyone knew each others’ names. We’d start content on the third day, which because of block scheduling didn’t come until the second week of school. That’s how I started my year as a teacher in 2007. This morning, I was drawn to a Michigan news report that East Lansing and Okemos High Schools are among the "top ten" in the state, according to U.S. News & World Report rankings. Curious, I wondered how these rankings were determined. The first two steps ensured that the schools serve all of their students well, using performance on state proficiency tests as the benchmarks. For those schools that made it past the first two steps, a third step assessed the degree to which schools prepare students for college-level work. First, comparing each school's standardized assessment scores in math and reading to state averages (with an unspecified nod to schools with higher levels of economically disadvantaged students). Then, they compare each school's standardized assessment scores in math and reading for black, Hispanic, and low-income students to state averages for the same groups. Of the schools that perform better than state averages in both of the areas specified above, U.S. News ranks them "using Advanced Placement or International Baccalaureate test data" as the benchmark for college-readiness. This third step measured which schools produced the best cllege-level achievement for the highest percentages of their students. This was done by computing a "college readiness index" (CRI) based on the school's AP or IB participation rate (the number of 12th-grade students in the 2010-2011 academic year who took at least one AP or IB test before or during their senior year, divided by the number of 12th-graders) and how well the students did on those tests. My district is in its first of a three-year initiative to transform our traditional high school into an Early College. From 2007 through 2010, 74% of our students chose to attend a 2- or 4- year postsecondary institution. Of that group, only 44% successfully completed their first year; thirty percent have yet to earn their first 24 credits. We think we can improve upon this and are working with the New Tech Network and the state of Michigan to re-imagine everything we do to get there. Our goal for the class of 2016 and beyond is a first-year postsecondary success rate of at least eighty percent. To achieve this goal, we will decrease the number Advanced Placement courses we offer, and we have no plans to start an International Baccalaureate program. In fact, we may stop offering any advanced courses at our high school altogether. letting any student who is prepared to go to college dual enroll as early as their junior year of high school. increasing our focus on the students who are not yet prepared through changes in curriculum, instruction, and interventions. offering all students the opportunity to "stick with us" for a fifth year so we can offer support and funding for their first year of college. As students in our Early College, all young adults in our community have an opportunity to earn up to an associates degree from our area community college after five years of high school. The credits earned toward this degree (or non-degree program) are fully transferrable, earned on the college campus (we plan offer shuttle service to and from our building), and are completely free to the student. Students who elect to "stick around" for that fifth year can attend all classes at the community college and never have to step foot back into the high school if they don't want to. Our early estimate, based on data collected from the class of 2016 during their freshmen year, is that 60-70% of our students will opt to let us pay for their first year of college. Approximately 20%-30% tell us that they currently want to leave immediately after high school to attend a 4-year university. Around 10% of our students have alternative plans involving the military, a trade, or an alternative career. We are in talks with other institutions of postsecondary education interested in partnering to offer a wider range of opportunities to our diverse student body. For us and our community, success is not defined only by college entrance and success. Let's assume that my teachers and I are able to achieve our goal and, in fact, over 80% of our students complete their first year of postsecondary education successfully. Let's assume that this success occurs evenly amongst our diverse population. I am sure the growth from 44% to 80% would be noted by someone. The community and the school would all be pleased and as proud of our young people as ever. The Board of Education might recognize our efforts. The news might even pick up on the story of our success. Due of the narrowness of criteria used by organizations like U.S. News to define college readiness for their rankings, we will be listed below (far below) the larger schools in our state that offer Advanced Placement and International Baccalaureate courses. In the end, I don't care to make it onto these lists; that's not my point. Rather, my hope is that by telling my school's story, and by sharing the methods behind how these lists are compiled, we might start a conversation about the metrics being used to evaluate the success of our schools. After all, should schools be assessed by the number of students whom are successful at scoring well on complex tests? Or, should they be assessed by the number of students whom are successful at actually completing their postsecondary goals? Isn't it time that we find a new metric for high school success? The New Tech Network has uploaded the video of my Ignite Talk at the closing session of their annual conference last year. For the record, if I seem nervous and rushed, it's because I am. Ignite presenters are given only 5 minutes to present 20 slides that auto-advance every 15 seconds. I'm trying to pack a lot of (too much) information into each slide. Overall, the product is watchable and the message is something I think about a lot as a school administrator. Enjoy. Here are the slides and notes from my Ignite talk from yesterday. Please keep in mind that my notes were just that: notes. I did not say these exact words on stage. When the video goes up, I'll update this post. I'd like to share a simple idea that changed the way I view my role as a school administrator. In doing so, I'd also like to challenge you to reflect upon your school's current discipline policy and how you personally deliver consequences to the young people you serve. Before I make my point, though, I need to start with some definitions. Behavioral Psychologists define learning "as the process leading to long-term or potential behavioral change." Typically this takes one of two forms. Punishment can be defined technically as "any consequence to our behavior that reduces the likelihood that we'll repeat the behavior again." For example, if I ridicule a student for talking in class, and she does not like ridicule, then she is less likely to talk in class in the future. This is punishment. The flip side of punishment is reinforcement, which can be defined as "any consequence to our behavior that increases the likelihood that we'll repeat the behavior again. For example, if I tell a student that she is a good writer and she respects my opinion then she is more likely to write in the future. This is reinforcement. Of course, years of living this way in public education have left us all understanding these concepts all too well. Do your work or you will fail. Put your cell phone away or I'll take it away. Raise your hand and then I'll call on you. In public education, we get behavioral modification. 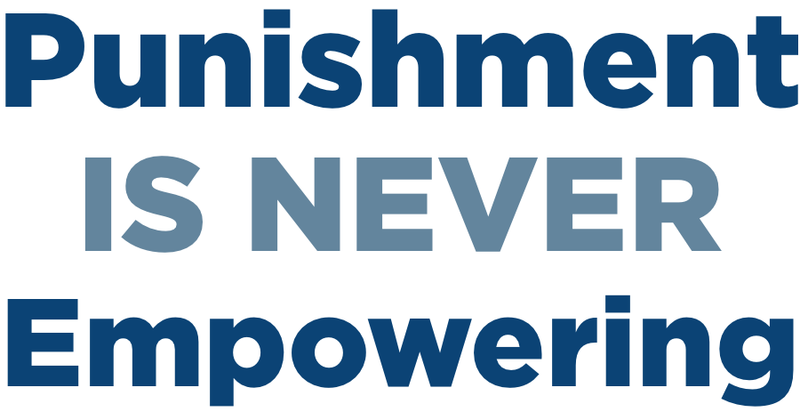 All to often when we talk about disciplining children what we really mean is punishment. I'd like to make the point today that discipline and punishment are not the same thing. Discipline is something we want our students to embrace from within. Punishment is a tool frequently used in schools that comes from without. The message to the punished is this: "You're not able to discipline yourself. You have done something wrong. Therefore, we're going to do bad things to you to teach you a lesson." The very nature of this is the opposite of empowering. It removes power. It was the realization that if I'm to create a culture that is truly empowering then I must punish less. In fact, I probably shouldn't punish at all. Instead what I needed to do was find a way to reinforce much, much more. Because I like and respect you, I need you to know that I'm not crazy. Remember that reinforcement and reward are not the same thing. I'm not recommending that you ignore anti-social behavior and I'm certainly not suggesting that you start giving our lollipops for all types of good behavior. What I am saying is that we need to find a way to reframe the way we communicate consequences to turn them into reinforcers. Here's a little trick to help you do this: take any traditional punishment, add the preposition "until" followed by a pro-social consequence, and you should have a reinforcing statement. Let's look at an example. Consider the statement "You have detention." Assuming that the student being assigned detention doesn't like it, the purpose of this consequence is to reduce behavior. By our definition earlier, then, this is punishment. Now, let's take that exact same statement and apply until to turn it into reinforcement. In this revised statement, notice that the student still has detention, but I've respected the student enough to add a condition to get out. I've turned the traditional punishment of detention into a reinforcer because instead of focusing on reducing bad behavior, I'm focusing instead on increasing good behavior. The student is now more likely to come to me with a plan. Let's look at one more example. Consider the punishment "Shut down your computer," said to a student for overusing social media during group work time. Never happens, right. This statement, taken at face value, is punishing because its purpose is to reduce social media overuse by this student in the future. If we apply my rule and add the until to this statement, we change the focus of the consequence form, "You are bad and cannot handle using your computer" to "Let's talk about this later on when I have more time." This student is now more likely to talk to you later, thus it is a reinforcer. The cynics and psych minors in the room will tell you that things are never this black and white. While issuing these consequences our goal is still to reduce bad behavior. But the focus of the statement has changed from what you are doing to the learner for being bad to what the learner has to do to be good. The next time and every time that you issue consequences to students, ask yourself where you're attention is focused? What message are you sending to students about who they are? Have you given ample opportunity to correct what's been done? Is your consequence respectful? If the answer to these last two questions is no then step back and ask yourself if you're truly empowering students at all. Be tough on yourself to rethink traditional punishments in a way that will shift the focus from what's been done to what can be done. Take advantage of consequences by treating them as opportunities to connect with students about their decisions and the effects that they have on others. After all, aren't most behavioral issues in schools related in one way or another to relationships. As a point of caution, don't be creepy by overusing this idea or becoming overly manipulative. For example, don't give students unrealistic expectations to fulfill like raising their grade from a D to an A to regain your trust for using a cell phone during class. The last point I want to make is to love what you do. If ever you're considering a consequence for a child that doesn't make you feel good about the work that you do, ask yourself if there's another way to frame it so it better aligns with your personal and school philosophy. Thank you.